When I wake, the world is filmed with silver rain: the air gray as an antique tintype. It’s the kind of day that makes you want to burrow deeper under the covers, but I don’t. Some instinct drives me out into the cool air and fog, the crunch of first leaves under my feet. I’ve always been one of those people with a hunter’s instincts, when it comes to beauty. I can feel it, sometimes, just around the next corner, or hiding in the shadows of the trees — feel it as a prickling on the skin of my forearms, or a sudden kick inside my chest. It’s an instinct that never fails me. Today, that sense beckons me down the street and around the bend. I let my feet take me down the hill toward the woods, which is where I expect that the magic is waiting for me, in the leaves. But I don’t have to go that far. Instead, I slide to a sudden stop right there on the sidewalk, my breath catching, the sense of nearby wonder sharpening all my senses. 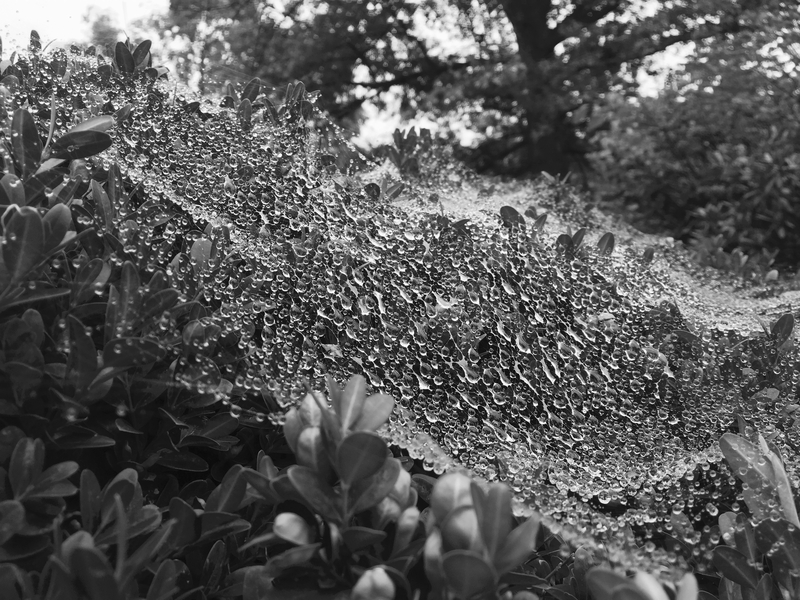 It’s the most ordinary thing, really: a spiderweb crowning a boxwood, there by the road. 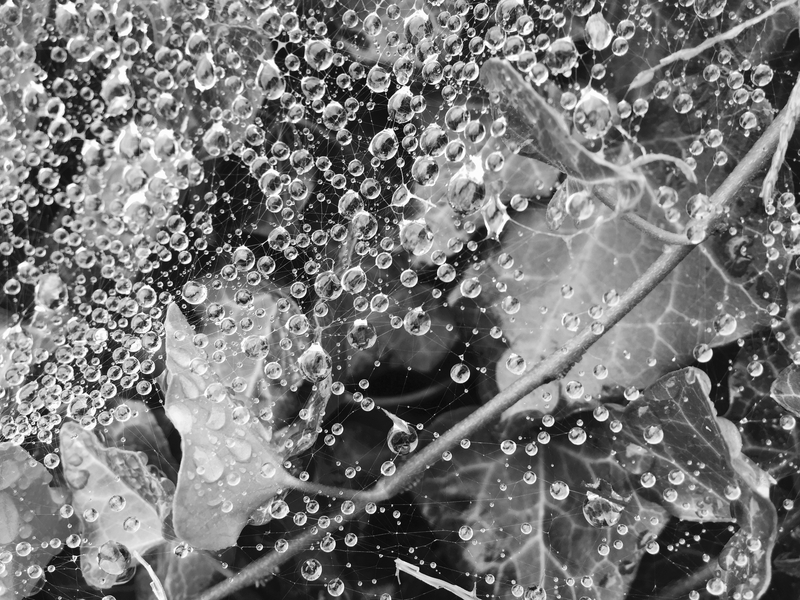 Except that the spiderweb is spangled with raindrops — thousands of them — and each of them catches and holds the light like a jewel. The sight of it — and I mean this quite literally — takes my breath away. I get down on my knees with my iphone. It doesn’t matter, what the drivers of the passing cars might think, or that my knees are wet, or that the time is passing, somewhere. All that matters is this: the light in the leaves, the light in my head, my chest, ricocheting around in my soul. I walk a little further and find more spiderwebs — a handful of them. Then dozens. Suddenly it’s as if the whole word is wearing a tiara that Cartier couldn’t recreate if it tried. Isn’t nature beautiful! What great pictures. Spiders get a really bad wrap. Such interesting creatures spinning such interesting designs! Haha, indeed! Again – beautiful pics and beautiful thoughts!